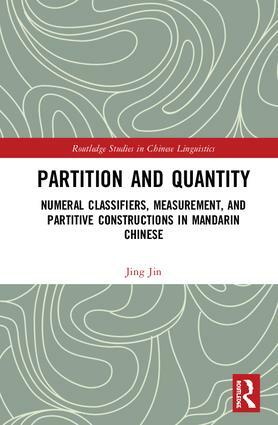 Partition and Quantity: Numeral Classifiers, Measurement, and Partitive Constructions in Mandarin Chinese presents an in-depth investigation into the semantic and syntactic properties of Chinese classifiers and conducts a comprehensive examination on the use of different quantity constructions in Chinese. This book echoes a rapid development in the past decades in Chinese linguistics research within the generative framework on Chinese classifier phrases, an area that has emerged as one of the most cutting-edge themes in the field of Chinese linguistics. The book on the one hand offers a closer scrutiny on empirical data and revisits some long-lasting research problems, such as the semantic factor bearing on the formation of Chinese numeral classifier constructions, the (non-)licensing of the linker de (的) in between the numeral classifier and the noun, and the conditions regulating the use of pre-classifier adjectives. On the other hand, particular attention is paid to the issues that have been less studied or gone unnoticed in previous studies, including a (more) fine-grained subcategorization of Chinese measurement constructions, the multiple grammatical roles played by the marker de (的) in different numeral classifier constructions, the formation and derivation of Chinese partitive constructions, etc. Jing Jin is Assistant Professor in the Department of Chinese Language Studies at The Education University of Hong Kong. Her research interests lie in syntax, syntax-semantics interface, and Chinese linguistics.